Former Argenta High School Building? Argenta (population 921) is located in east-central Illinois in the northwestern portion of Macon County. Argenta sits about six miles northeast of Decatur. Illinois Route 48 is the main roadway leading to and from Argenta. Interstate Highway 72 runs to the southeast of town. The Illinois Central Gulf Railroad runs alongside Route 48 while the Kickapoo Creek flows around the northside of Argenta. The history of the town of Argenta and its school system are in need of research;. It is probable that a school system was in place for Argenta students by the late 1800s. A high school was certainly in place by the early 1900s. Argenta High School served the town and surrounding rural kids for over six decades. Consolidation talks arose in the mid-1960s between the school districts of Argenta and the nearby town of Oreana. This effort led to the creation of the Argenta-Oreana School District in 1966. 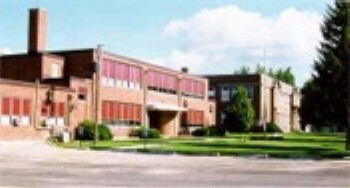 The high school for the new district is still located today in Argenta. It was for many years held in the original Argenta High School building which is pictured above, with a few building additions. Recently the Argenta-Oreana School District completed a new building for $15 million that will serve the two towns and surrounding area for many years to come. Argenta High School offered boys basketball (www.ihsa.org) and probably baseball, track, and football as well. Team nickname, team colors, team records, coach's names, and school fight song are all items we are seeking to help better document the Argenta HS athletic program. Argenta High School was a cause for great excitement on many a winter night. The boys basketball team had some great seasons in the 1950s and early 1960s. A total of SEVEN District titles and one Regional title showed the Argenta HS strengths of the era. The year of 1950-51 saw Argenta's deepest run into the State Tourney making it all the way to Sectional Tournament action. Coach's names and team records of these and other great Argenta teams are not currently available. Scores involving Argenta HS in the IHSA State Tournament were located on a website titled "Illinois High School Postseason Basketball Scores" and are listed below. 1922-23 through 1931-32 Postseason scores, record, and coach's name needed. ARGENTA (60): Dalton 21, Groves 12, Harrison 11, Walters 7, Craft 6, Reeser 2, Hallendorf 2. MATTOON (58): South 14, Wagner 13, Sewell 13, Davis 7, Manuel 3, Branson 3. DECATUR (73): Meurlot 28, Poland 19, Olivero 10, Norman 9, Shildneck 4, Hughes 2, Alderson 1. ARGENTA (57): Walters 21, Groves 13, Dalton 13, Craft 5, Reeser 3, Harrison 2. Argenta finished as one of the Top 32 Teams in the State! MAROA (82): Brown 18, G. McClung 17, Chalcraft 15, Staudt 12, L. McClung 12, Connelly 4, James 2, Thomas 2. ARGENTA (57): Roberts 29, Fear 12, Nixon 6, Phillips 6, Justice 3, Querry 1. CLINTON (57): May 16, Steward 14, Helm 11, Griffin 10, Hartsock 6. ARGENTA (54): Fombelle 13, Allan 13, Beadleston 10, Bryant 10, White 6, Drake 2. Stephen Decatur placed 4th in IHSA state tourney. "I was researching my father, Don Sullivan, basketball coaching career and found an Argenta High School page in need of information. My father coached at Argenta beginning 1948-1949 through the 1953-1954 seasons. After that he coached the 1954-1955 Peoria Spalding team to the Elite Eight 22-6. His next position was a year at Farmer City 1955-1956 before moving on to coach at LaSalle-Peru. This finished his high school coaching as he coached an AAU team "Ottawa Falstaff" and then a stint at LPO Junior College before becoming the first basketball coach at the College of DuPage. Both my father and his brother Andy coached at the same time and were a successful part of IHSA basketball history. I recently saw scrapbooks with newspaper articles and pictures from some of his time at Argenta, Peoria Spalding, and Farmer City. Dad has a large frame sketch of old Peoria Spalding in his living room given to him be a team member at a class reunion and has been a lifetime friend of a player he coached on the 1950-51 Argenta team that was beaten by Decatur in the Sectional Final." "I was in the Argenta - Oreana school district from 1961- 1973 . We were known as the Bombers the entire time.That has been their nickname for a long time. Before WWII probably was different."